Stephanie Lauren Stumpe, Leslie, and David Allen Schatz, Sullivan, were united in marriage on Saturday, Sept. 17, 2011, at Temple Baptist Church in Sullivan. The Rev. Scott Perry officiated at the 2 p.m. ceremony. Bride’s parents are Steve and Cathy Stumpe, Leslie. Groom’s parents are Dave and Chara Schatz, of Sullivan. The bride is the granddaughter of Ila Faye Stumpe and the late Norman Stumpe, Sullivan, and Dorothy Brueggemann and the late Albert Brueggemann, Union. The groom is the grandson of Jack and Ann Cuneio, Doris and Joe Hallam, and the late Neil and Sarah Schatz, all of Sullivan. Serving as maid of honor was Tiffany Stumpe, bride’s sister. Briana Perry served as matron of honor. Bridesmaids were Devon and Dana Schatz, groom’s sisters, Kara Riley and Kristen Stumpe, bride’s cousins, Maggie Jones, Jessica Nigh and Lindsay Hellebusch. Junior bridesmaid was Dailee Schatz, groom’s sister. The ceremony was dedicated to the honorary best man, Daniel Austin Schatz, groom’s brother. Groomsmen were Beau Bartolotta, groom’s cousin, Jeremy Stumpe, bride’s brother, Bradley Perry, Jacob Voss, Geoff Meade, Nick Schaefer, Kelian Nigh and Jake Hilton. Junior groomsman was Balor Bartolotta, groom’s cousin. 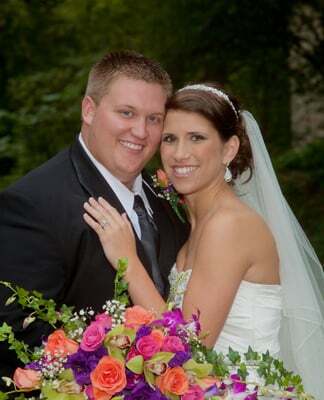 Candlelighters were Bria Bartolotta, groom’s cousin, and Katie Wells, bride’s cousin. Flower girls were Sydney Montee, groom’s cousin, and Ruthie Riley, bride’s cousin. Ring bearer was Parker Montee, groom’s cousin. Program attendants were Mackenzie Montee, groom’s cousin, and Danette Stumpe, bride’s cousin. Guestbook attendants were Ava and Ellie Cuneio, groom’s cousins. Ushers were Anthony Carey, Matthew Montee, groom’s cousin, Tyler Stumpe and Luke Wells, bride’s cousins. A dinner and dance reception was held at the Eagles Hall in Sullivan. The bride is a graduate of Sullivan High School and the University of Missouri-St. Louis. She is employed as a registered nurse at Mercy Hospital St. Louis and is attending graduate school at Maryville University. David is a graduate of Sullivan High School and Westminster College in Fulton. He is employed at Schatz Underground in Villa Ridge. After a wedding trip to the Caribbean island of Saint Lucia, the couple reside in Sullivan.